The best Windows ever meets the best Dell ever. The result? A whole new era of power, performance and productivity. Windows 10 gives you all the features you know from the world’s most popular operating system, plus great improvements you’ll love. 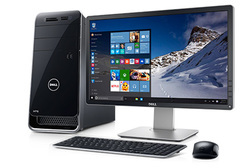 See why there has never been a better time to buy a Dell. Windows 10 features are subject to change and may vary by device and by market. With exceptional technology, impressive performance and exciting new Windows 10 features, there has never been a better time to buy a Dell PC. 1. Cortana available in select global markets at launch; experience may vary by region and device. 2. Broadband internet required for some features (ISP fees apply). Xbox Live features only available with supported games in Xbox Live-supported countries, see xbox.com/live/countries. Limited number of games available in 2015 that support cross-device play; additional games to follow. Stream to one device at a time; streaming with multiplayer from Xbox One requires home network connection and Xbox Live Gold membership (sold separately); Gold also required for multiplayer play on Xbox One. DirectX 12 only available with supported games and graphics chips. Game DVR only available with supported hardware. To check for compatibility and other important installation information, visit your device manufacturer’s website and www.windows.com/windows10specs. Xbox One, PC/Tablet and Phone versions of games all sold separately. 3. Some apps from the Windows Store sold separately; availability and experience may vary. 5. App and content availability varies by market. Windows 7 devices must have SP1 installed and Windows 8 and Windows 8.1 devices must have Windows 8.1 Update installed. Additional hardware and software requirements apply and will be further communicated. Windows 7 Enterprise, Windows 8/8.1 Enterprise, and Windows RT/RT 8.1 are excluded from the offer. Not all Windows 10 features will be available for use on all qualifying devices. Devices must be connected to the Internet and have Windows Update enabled. ISP fees may apply. ◦ Yes, free! This upgrade offer is for a full version of Windows 10, not a trial. 3GB download required; standard data rates apply. To take advantage of this free offer, you must upgrade to Windows 10 within one year of availability. Once you upgrade, you have Windows 10 for free on that device. ◦ Windows 10 Upgrade Offer is valid for qualified Windows 7 and Windows 8.1 devices, including devices you already own. Some hardware/software requirements apply and feature availability may vary by device and market. The availability of Windows 10 upgrade for Windows Phone 8.1 devices may vary by OEM, mobile operator or carrier. Devices must be connected to the internet and have Windows Update enabled. Windows 7 SP1 and Windows 8.1 Update required. Some editions are excluded: Windows 7 Enterprise, Windows 8/8.1 Enterprise, and Windows RT/RT 8.1. Active Software Assurance customers in volume licensing have the benefit to upgrade to Windows 10 enterprise offerings outside of this offer. To check for compatibility and other important installation information, visit your device manufacturer’s website and the Windows 10 Specifications page. Additional requirements may apply over time for updates. Security and features are kept automatically up-to-date which is always enabled.